One of the meetings I attended last week was in Addis Ababa where my stay in the dignified Sheraton Hotel was slightly spoiled by the vista behind the reassuring fence, where people in rags seemed in general to be enjoying slightly less comfort … Thankfully, the local draught did not affect the water pressure at the fountain systems around the hotel where we took the edge off with regular dips in the heated pool, usually before high tea. The theme of the meeting was “Draught and Famine – HRI opportunities for 2010” but it was naturally also a welcome occasion to catch up with my trusty colleagues as well as with other dignified HRI consultants, who always stay at the Sheraton (the Hilton nearby has lost much of its dignified air and remains unreasonably crowded). Yes, the Sheraton in Addis is obscene compared to the surroundings. And the prices of rooms: $450/night are obscene too. 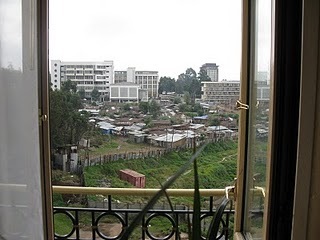 Could the Aid people just stay at one of the $75/night hotels in Addis and save the money for the aid? Why is a price of $450/night obscene when in Addis and not say in New York or Chicago ? People writing about obscene prices have a salary or some source of income. They probably have their own laptop to write these messages via their broadband Internet connection (24/7). Compared to the income of people living in parts of Ethiopia (probably Addis as well) that salary is obscene too. I agree in general about not staying in the Sheraton (whatever business you are in, whatever country you are in). But I also agree in flying Economy (if you have to fly), not walking around with a bottle of water all day, on your 150 dollar hiking boots, with you’re 100 dollar backpack, with your 700 dollar camera and so on and so on……..
Piped muzak, cocktails on the veranda, and some jolly pleasant conversation with some self-important aid bureaucrats boasting about their tax-free salaries, all overlooking the shacks beyond the fence. It was surreal. I couldn’t get out of my head the thought that the shack-dwellers, in all probability, at least had the dignity of paying some tax. If aid bureaucrats spend much of their time living like this, how can they possibly be in touch with the people they are there to serve. (*) not the Hilton as previously claimed – you really don’t get quite the same inflated sense of your own superiority there. There is something a little funny about this conversation. Having lived and worked in the region for a very long time, I can remember during the famine in the 80s when there were the same observations about the Hilton (poor downtrodden Hilton, according to the comments, is now no longer considered posh). With thoughts like those of the commenters in mind, in those days (where there werent many choices) I used to stay at the Ras or the Wabe Shebelle or, if feeling flush, in the Ghion. With the feeling that at least they belonged to Ethiopia, not a multi-lateral corporation. But then again, that was under the Dergue, so providing funds to that regime wasnt very comfortable, either! Luckily, Addis is full of very clean and decent lower price hotels now. There is something for everybody.